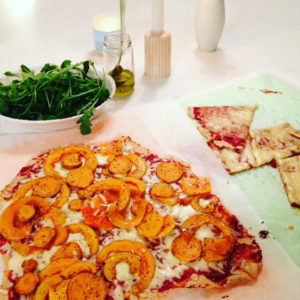 This is such a favorite… oh how we all love it… Every Friday night it’s pizza night! Making your own thin organic spelt/kamut pizza base without any yeast takes no time at all! And it is light in your stomach. 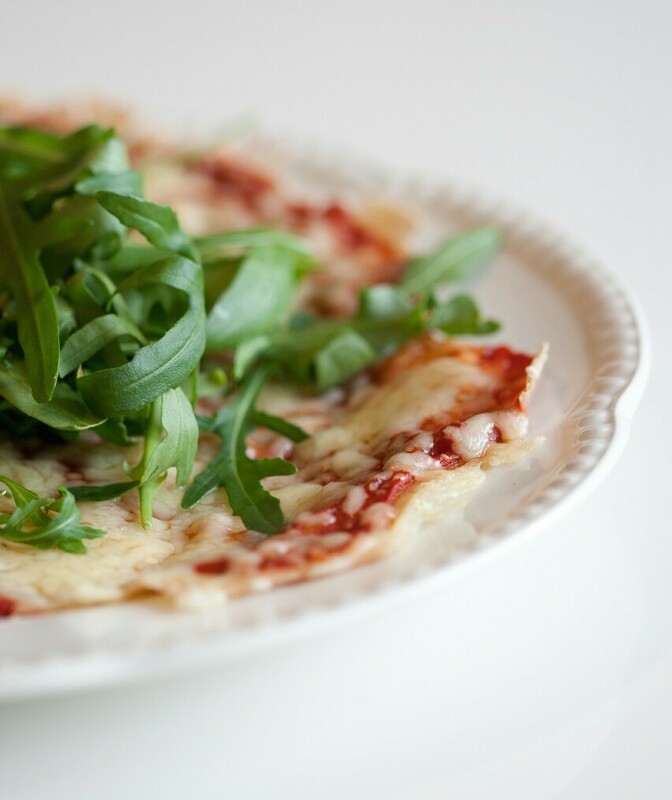 Serve it with rucola and garlic olive oil and you are going to sing! :) .. If you like baked vegetables on top you start by turning your oven on, washing your vegetables, thinly slice them, arrange on a baking paper, add olive oil, seasalt and pepper and bake while you make the base. This base is a recipe from dear RawSolla. Here you find a gluten free base (quinoa). It’s equally delicious! But this photo is from me 🙂 .. From one of our Friday nights .. I always put baked vegetables on top of our pizza. Blend the dry ingredients together and then mix in the hot water. Make a dough using a spoon first and then your hands, ADD MORE WARM WATER if needed. (All this takes around 3 minutes). Then I use a little fine spelt to roll out VERY THIN pizzas with a rolling pin. This makes for 3-4 large pizzas at the size of an oven plate, depending on how thin/thick you make them. If you love baked vegetables on your pizza start by washing a sweet potato for example and a courgette. Thinly slice both and spread out on a baking paper on an oven proof dish. Brush with olive oil, sea salt and black pepper and bake for around 20 minutes. Happy goji smoothie, it's divine!! 5 Replies to "Spelt pizza for Friday nights (yeast free!)" Thank you, I will try it. Can I buy fine and whole Spelt? Ahh skil, frábært 🙂 Takk!